Who should walk you down the aisle on your wedding day? Who should walk you down the aisle on your wedding day is a very good question. In the world that we live in this can often enough be a tricky question for a lot of reasons. Some grow up with a single parent raising them, some grow up where they have lost a parent or parents, some are simply not close to a parent and some not as traditionally inclined to have to have their fathers walk them down the aisle at all and prefer to walk alone independently. Oddly enough this is not a question for anyone else to answer but the person being walked down the aisle as that walk needs to be significant for them as they begin on their wedding/marriage/matrimonial journey with their partner. 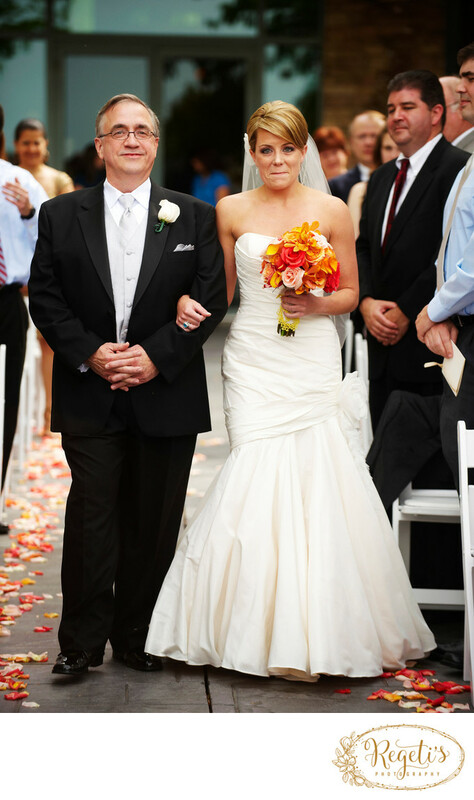 But this image of Lauren's father walking her down the aisle is certainly one that all traditional can appreciate! Location: Lansdowne Spa and Resort, Leesburg, Virginia. Keywords: Bride (54), Father & Daughter (3), Walking Down the Aisle (3).